I have posted an answer to a question that is advocated by the full manual entry itself for the particular situation. While my approach is perhaps not the most straightforward way of achieving the goal, it is in the end what the system ends up advocating in situations where a discovery of additional kernely systems is not required. 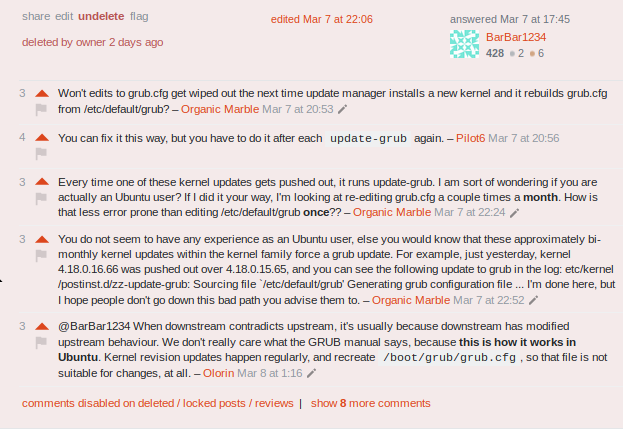 Clearly, two users who downvoted my answer were either not familiar with what the manual itself advocates, or that my answer - while still achieving the exact goal that was desired - was also meant to point out that it is important to realize that it is the configuration file in the /boot/grub folder that in the end gets changed and changing what others seem to recommend does not actually result in the effect desired. I wonder if there is some particular way how one might request a look at the answer provided when there seems to be a disagreement between what is posted in the actual manual for the command and what other users who downvoted the original answer seem to recommend. I do not care that much about the downvotes, as much as I care about having the answer or answers to questions either agree with the manual itself for the commands, or have such answers offer specific reasons why the manual entry should be edited. Is there some way an answer to a question can be elevated for a reevaluation similar to how a bounty can be attached to the original question itself? Add a summary section at the top. e.g. "TL;DR .... You've edited the wrong file and it's getting replaced." Avoid bolding too much, particularly at the top, and bolding is really for headers and the occasional word. In the words of @muru, "an entire sentence bolded is unhelpful". Although I personally use bolding to draw the reader to the conclusion /question in much the same way as (1), so YMMV. Put edits at the bottom or better, add them to your answer, we can see all edits in the edit log anyway. Summarise your copying. e.g. Your quote could be reduced to the pertinent points or the pertinent points could be bolded. At a quick glance I don't see what you're referring to. Help the reader. If you do an edit to a question, there's no harm in adding a comment to the question to say you've updated your answer. This sends a signal to the questioner. You can't make them change their vote, but you can point out you have improved it. Try to think about your answer from the perspective of someone who is time-poor, as all moderators are. Why aren't most questions answered with references to documentation or mention to RTFM?